Behind the magic of a well prepared salad lies the hidden thread of dressing. From simple oil and vinegar to complex concoctions with exotic ingredients, this cold sauce turns garden harvest into a dish. The origin of dressing might be associated to the Mediterranean where olive oil was lathered onto anything even stuff that did not make it past lips. Romans bathed in oil, scraping dirt off along with the oil. Oil also played it’s part in signifying the important in the middle east. So why not anoint a vegetable before it hits the palate? Over time this venerable act of dressing greens grew into quite a tradition. Along with the seductive qualities of olive oil, vinegar was added to brighten up the flavors. The sharp tongued liquid adds contrast and excitement. Like dance partners, this duo of oil and vinegar becomes the culinary tension which gives most dressings their due. Now enter other cleverness. Mustard. Salt. Spices. Onion, Fruit. Nuts. Dairy. Or just about anything that could be liquefied. Mix this into the salad cement. That is what we enjoy today. Bottled and beautified with bright labels, we buy flavored elixirs for our raw vegetables every day. Saunter down the isle in the neighborhood grocery and marvel at the selection. Feeling moody and mysterious? There’s a blue-cheese waiting for you. Feeling the liberation of the late sixties? Grab a hold of Green Goddess. Have children? No doubt Ranch dressing has shown up on the grocery receipt. Like most things which cross our gums, fresh is favored. So it’s worth having a deeper look at a well made vinaigrette. Where to begin? Pull any classic cookbook down and open to the right place. Somewhere on that page, a swath of ingredients stares back at you. Don’t pause. You are in charge. Today we break the list into the primal elements. 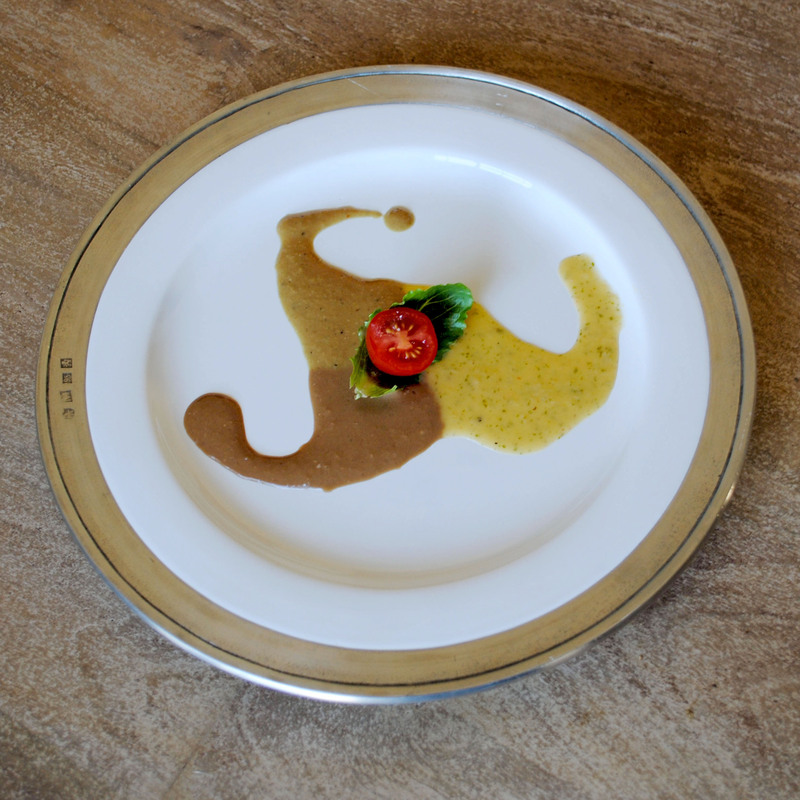 Let’s begin with the famed balsamic vinaigrette. That tasty dance partner which sneaks into ballrooms all across america’s dining rooms. Sultry and sweet, this ruddy liquid swoons baby romain, little carrots, fresh plum tomatoes and just anything the gardener has on hand. Beyond the veil, find the basic tastes. At it’s prime, balsamic is a vinegar, which means that it hugs onto the tradition of sour. More gentlemanly than red wine vinegar, less vulgar than white vinegar, more famous than sherry wine vinegar, this inky goodness comes from grapes grown exclusively for the production of vinegar. Who knew? Do not forget dijon mustard to hide daggers and intrigue. Jumping to the palate opposite is sugar with all of it’s natural sweetness. A secret of the kitchen insiders, honey acts as not just the counterbalance to the tart, but provides a chemical agent to emulsify the vinegar in the oil. Bitter finds its’ way into the mix through raw onions. Today’s’ experiment showcases red onion, though shallot would do nicely. This ingredient infuses flavor and brings body to the dressing. Salt in any form settles up at this poker table as well. Same with optional spices or herbs which might deepen flavors. Or just provide the right “devil’s advocate.” Raw garlic in the right proportion is never out of place. Last comes the sumo wrestler. Oil in all it’s glory. Round and huggable. Olive oil if your mind drifts to old world. Vegetable oil if the voices in your head are louder than reason. And there you have it. Dressing. Pulse in the Cuisinart. Whisk all the ingredients together first adding the oil drip by drip until you have a homogeneous whole. Gasp! We have not mentioned proportion. Gander at the recipe matrix to see the fundamentals. Keep in mind that this represents a rudimentary version and your palate might tease the proportion differently. Like a bit more sour? Amp up the dijon? Intrigued by sugar kisses? Go heavy hand on the honey. It’s your concoction. That out of the way, let’s have a look at variations. We embrace sour, sweet, salty, bitter, spice and oil. Find anything which fits that profile and substitute. 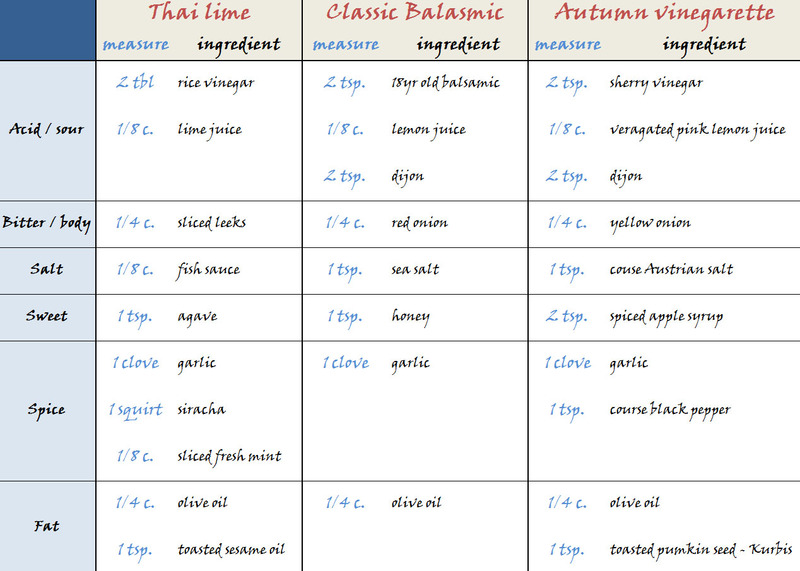 For illustration, find the recipe for an autumn version of the balsamic. Sour finds a voice in Sherry Wine vinegar. Honey is easily replaced by spiced apple syrup. And to bury the flavors deep into the season a hearty toasted pumpkin seed oil, a.k.a kurbis is sneaked into the potion. What emerges is a heady version of balsamic vinaigrette. Now swing radically to the east. Let’s blow up every ingredient (save the olive oil) and find an Asian-scentend equivalent. Lime, shallots, and agave syrup take the stage. However fish sauce (alternative salt), siracha (garlicky hot sauce) and fresh mint from the garden explode into the production. Whirled into a single whole this simple compilation carry’s the weighty blow and whisper voice of a shoalin monks. It begs for big greens, plump boiled shrimp and colorful Holland peppers. There you have it. Three dressings with roughly the same body build. Yet all radically different flavor profiles. Experiment on your own. Find new fats or sugars to add. Try alternative vinegar or spice it up with herbs. Listen to the inner chef. Please your own palate. Then please someone else’s. You won’t be disappointed.